Cyrille Aimée has long-since gone the way of the gypsy. The 34-year-old grew up in the small town of Samois-sur-Seine in northern France and was constantly intrigued by the caravans of musicians and gypsies that would plant themselves in her neighborhood every summer for the annual Django Reinhardt festival. “The Django festival was part of my life even before I wanted to be a musician. I’d go run around in the street for the festival. It was free for kids … all the other kids were running around. Little by little, I started to be interested in the music part of it,” she says. Stemming from a spontaneous, circus-like episode in which Aimée found herself pedaling her bike down the street with three gypsy girls piled onto it, it wasn’t long before she became an honorary member of the visiting clan. Aimée started sneaking out of the house late at night to join the gypsies around their musical campfire and developed a love for singing. By the time she was 18, she was invited to perform on Star Academy, the French equivalent of American Idol. At that point, however, she had already decided to head to New York to study jazz at Purchase College. She did not, however, grow out of her affinity for the gypsy lifestyle. Between semesters, she would bring Jazz Studies friends back to Europe and they traveled from city to city, performing on street corners for cash. In Italy, the crew performed at a club during a jam session. The manager was impressed. As her friends waited in Italy, Aimée ventured to Montreux, Switzerland on her own to try her vocal chords in a singing competition at the Montreuz Jazz Festival. She won. After this adventurous summer, Aimée and her friends returned to Purchase, where she graduated and relocated to Brooklyn, from whence she continues to travel the world performing with orchestras, ensembles, quartets and duets. Aimée’s 10th album, Move On, A Sondheim Adventure, was released this February, featuring an eclectic selection from composer Stephen Sondheim’s vast songbook. Aimée appeared in Sondheim and Wynton Marsalis’s 2013 production, A Bed and a Chair: A New York Love Story, alongside Broadway greats such as Jeremy Jordan and Bernadette Peters, and her performance was heralded by numerous critics as a major highlight. 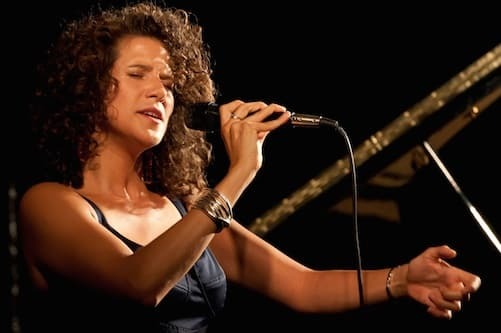 A Vail Jazz favorite, the French singer, accompanied by Eric Gunnison on piano, brings her sultry and theatrical stage presence to Ludwig’s Terrace at The Sonnenalp Hotel for back-to-back performances on March 5. Seating is jazz club style with full dinner and bar service available (a $30 food and beverage minimum applies). Doors opening at 5 p.m. for the 5:30 p.m. performance and at 7:30 p.m. for the 8 p.m. show. Tickets to each performance are $40. GO HERE FOR TICKETS TO THE 5:30 P.M. PERFORMANCE. GO HERE FOR TICKETS TO THE 8 P.M. PERFORMANCE. For more information, call 970-479-6146. It can be argued that live jazz is best enjoyed in a warm, classy lounge with snow falling outside. This is just one of many reasons to secure your spot at the 2019 Vail Jazz Winter Series. It’s Vail Jazz’s silver anniversary, so the Series is going big. Following the holiday kickoff extravaganza – a swing dance party at The Ritz-Carlton Bachelor Gulch with New York City’s sizzling eight-piece The Hot Sardines, the 2019 Winter Series is delivering more than ever before – seven evenings of live music throughout the winter. Five of these sparkling nights take place in the swanky lounge setting of Ludwig’s Terrace at Vail’s Sonnenalp Hotel. Entertainment for both the après crowd and the late-nighters. World-class artists light up The Sonnenalp Hotel on Feb. 26, March 5, March 12, March 19 and March 26 in a true jazz club format of back-to-back performances. The first seating appeals to the après ski crowd at 5:30 p.m. and the second targets late-night live music seekers at 8 p.m. Full dinner and bar service are available at each seating. When we say the 2019 lineup is “world-class,” we mean it. The Winter Series lineup is comprised of the most talented artists in today’s jazz world … lauded not only in the U.S., but across the globe. After his sold-out Vail debut last summer, American blues pianist and vocalist Joe McBride returns on Feb. 26, followed by French-born songstress Cyrille Aimée on March 5, the charismatic Emmet Cohen Trio on March 12, soulful gospel favorite Niki Haris on March 19 and finally Grammy-nominated pianist John Chin on March 26. That’s not to mention the savvy on intimate display at private residences for the Series’ invite-only gigs. Former Stevie Wonder band member and vocalist Robert Johnson performs with The Mark Diamond Trio on March 2 and Australian multi-instrumentalist Adrian Cunningham on March 30. Jazz has many musical wings and R&B is one of them. Joe McBride has oft been compared to Ray Charles. While the two share many characteristics – losing their eyesight at a young age followed by rapid development of tremendous vocal and piano talent – McBride has a sound all his own, even when he’s rolling through America’s favorite blues tunes. The Missouri native has recorded and/or shared the stage with everyone from Whitney Houston to Larry Carlton. He channels the spirits of Ray Charles, Stevie Wonder and other R&B Songbook masters with his own smokin’ energy and style on Feb. 26. A voice that will hypnotize. Anyone who has trouble believing that vocal cords are a serious instrument has never heard or witnessed the enchantment of Cyrille Aimée. The young singer’s versatile vocal skills have been noted worldwide, from her native France, where she won the prestigious Montreux Jazz Festival Competition, to New York City, where she’s won the Sarah Vaughan International Jazz Vocal Competition. Her voice has been enthusiastically described as everything from “saucy” to “sweet” by the New York Times. Lose yourself in musical passion. The power of The Emmet Cohen Trio is all-encompassing, like walking into a tunnel of sound where every one of your senses is simultaneously enlivened, yet relaxed. A musical prodigy from the age of 3, Emmet Cohen’s piano compositions and delivery run the gamut from fluid to explosive. The Trio hits every tone and color on the jazz palette on March 12. The rare treat of experiencing Niki Haris on a small stage. Every year at the end-of-summer climax event, the Vail Jazz Party, the first tickets to sell out are for Niki Haris’ Gospel Prayer Meetin.’ The incredible soul singer who spent years touring with Madonna might be making a rarefied appearance on a smaller, indoor stage, but you can rest assured that her output will be as large and in-charge as ever. She gambols through a potent gamut of romping numbers while saluting her fellow sisters of soul on March 19. The opportunity to witness John Chin before he’s swept up in big-time stardom. Born in South Korea and raised in California before moving to New York City and becoming a fixture of the Big Apple’s deep talent pool, John Chin draws inspiration not only from traditional jazz, but from pop, western and classical genres in his unique compositions. He’s released four albums as a bandleader and was nominated for a Grammy for his work on René Marie’s 2017 “Sound of Red” release. If you caught him performing with Marie in her Vail debut a couple of summers ago, you know he’s on a skyward trajectory. Don’t miss him at The Sonnenalp on March 26. Supporting the future of musical talent, locally and globally. In addition to bringing in some of the world’s finest artists for the Winter Series and the pageant of free and ticketed summer performances, Vail Jazz also does its part in fostering generations of musicians to come through unique educational programs. 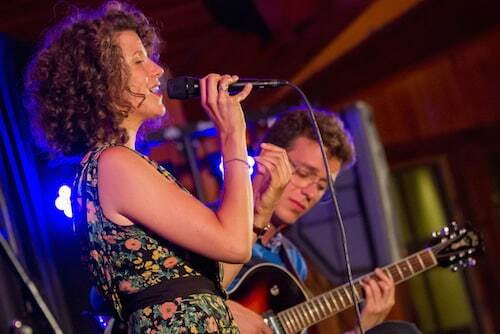 These include the year-round Vail Jazz Goes to School program as well as the free summertime Jammin’ Jazz Kids sessions and the Vail Jazz Workshop, which selects and finances 12 of America’s top teenage musical prodigies in an intensive, week-long study group that culminates with live performances at the Vail Jazz Labor Day Weekend Party. Every ticket purchased for a Vail Jazz performance or a donation made directly supports the nonprofit’s educational initiatives which, in turn, secures amazing talent for our children and their children to enjoy. Classy date night. It’s a beautiful, cold, wintery night and there you are, cozied up with your loved one in the elegant Ludwig’s Terrace, a glass of wine and gourmet meal on the table and one of the planet’s most talented musicians providing a scintillating live soundtrack a few feet away. A night out in Vail doesn’t really get more romantic. Learn more about Vail Jazz’s 25th Anniversary Winter Series.